How lethal is Ebola virus? Of the pathogens that keep worried scientists awake at night, few rival Ebola for ruthless efficiency. The virus contains just seven genes, yet it manages to kill up to 90 percent of the people it infects. 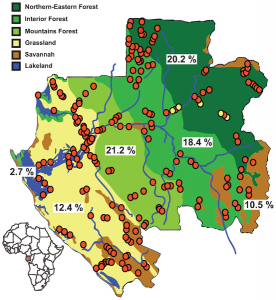 Zaïre, Sudan and Bundibugyo species have been associated with large Ebola haemorrhagic fever (EHF) outbreaks in Africa with high case fatality ratio (25–90%) while Côte d’Ivoire and Reston have not. Reston species can infect humans but no serious illness or death in humans have been reported to date. There have been roughly 1850 recorded cases with over 1200 deaths since ebolavirus was discovered, an average fatality rate of 65%. But have there been only 1850 human infections? The answer is clearly no. The results of several serological surveys have shown that many individuals have antibodies against Zaire ebolavirus – purportedly the most lethal. The results of one study revealed antibodies in 10% of individuals in non epidemic regions of Africa. A similar seroprevalence rate (9.5%) was reported in villages near Kikwit, DRC where an outbreak occurred in 1995. In addition, a 13.2% seroprevalence was detected in the Aka Pygmy population of Central African Republic. No Ebola hemorrhagic fever cases were reported in these areas. The high frequency of ‘immune’ individuals with no disease or outbreak history raises questions as to the real pathogenicity of ZEBOV for humans in ‘natural’ conditions. These findings indicate that the fatality rates of Zaire ebolavirus that are quoted widely are likely to be vast overestimates. Why the infection is more lethal during outbreak conditions is not known. One possibility is related to the size of the viral inoculum received. During outbreaks the virus is spread by contact with the blood, secretions, organs or other body fluids of infected individuals, which contain very large quantities of virus. In contrast, infections in nature – by contact with contaminated fruit, for example – may involve far less virus. Whether we are discussing avian H5N1 influenza, ebolavirus, or even the fictitious MEV-1, do not assume that widely quoted fatality rates are correct – check the scientific literature! Should we fear avian H5N1 influenza? Besides the inoculum size, the entry route might matter. Outbreak cases are often family members and healthcare workers who’ve had direct contact with the blood and other body fluids of patients with severe disease. Perhaps the “natural” route of infection involves oral or respiratory entry of animal body fluids instead. In any case, the literature on this virus, H5N1 flu, and some other “nightmare” viruses suggests that we need more seroprevalence studies on all of these pathogens. If it turns out that the really severe outcomes are freak incidents that don’t represent the normal course of infection, then we should try to determine the factors that push the disease one way or another, and aim treatment and prevention efforts there. Hmm. Remember a case report in South Africa of a patient who contracted Ebola, apparently from a room in a hospital where a previous patient had died of Ebola. The room had been decontaminated with bleach and left vacant for, I believe, 3 months prior. That inoculum could not have been large. Perhaps the virus has multiple variants that present the major antigens? Vast overestimate? Well, if the “up to 90%” case fatality rate holds true for outbreak conditions then it isn’t a vast overestimate. If you talking about non-outbreak conditions, then obviously that’s different. Something works to change the virus’ virulence in outbreak conditions. There is no evidence that viral virulence is different in outbreak vs non-outbreak conditions. You are assuming this incorrectly. Agreed… To me that, and the ‘transmission route’ making a difference does sound very unlikely as it effects the entire body rather than just whatever part it enters through. Perhaps outbreaks are more likely to occur in populations that do not have a large occurrence of these genes that cause immunity or partial-immunity. It’s certainly strange that 15% of people in areas that appear to have never had an outbreak of Ebola have any traces of it in them at all. given that ebola is a RNA virus, could the difference between outbreak and asymptomatic infection be due to a small mutation that is influential enough to interfere with some of the processes, but not enough to interfere with something like the tropism of the virus? Considering the possibility that many people who died from Ebola infection in the poor countries were never given a correct diagnosis, the fatality rate may be under estimated. No doubt someone else will have asked this, but what is the unchecked morbidity rate for ebola? In other words, without any medical or sanitation or PPE or quarantine controls, what % of the population would contract ebola? Is it only folk with natural immunity who would be spared? I can’t find the answer with searches or on the news. There is also the obvious factor of not receiving care needed to survive the worse during an epidemic. With most people sick the few remaining have far more to do and far less resources to do it with. If one person out of twenty is not sick they are responsible for giving the sick all their water, removing the dead, feeding the sick, bandaging all their wounds; while if the reverse is true then there are twenty individuals left to care for the single person ill. Same holds true for risk of contagion as well.